A ship drops anchor at the bay and a new game starts. The captain, mate, and entire ship are at stake. As sirens, you are trying to lure the crew of the ship to your lair. The player who lures the most crew members, wins. Players try to win more parts and crew members of the ship that is at bay than the other player. By playing cards to either side of the ship they try to create more attracting layouts than the other player and thereby win most parts of the ship. The crew will always fall for treasure and gold and for sure they cannot withstand the sirens and their tempting songs. Corals and sea creatures will put the crew off and they will go to other parts of the ship - with a little luck maybe right into the arms of your sirens?! A deep swig from the rum mug will help the captain and mate to resist the call of the sirens. And the mighty octopus can turn the tide in your favour just when you need it. Whoever bewitches most parts of ship and crew, wins. 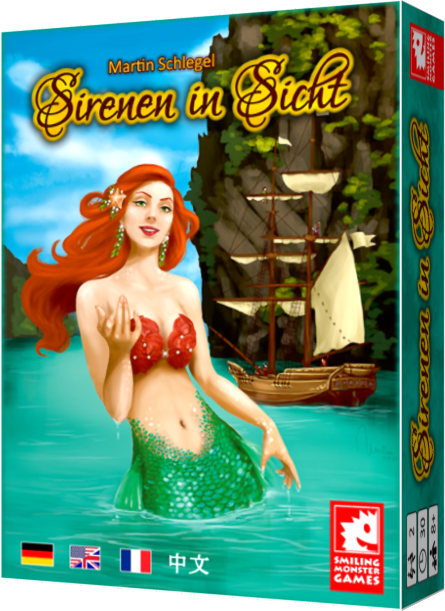 Sirens in Sight by Martin Schlegel for 2 players, ages 8 and up, approx. 30 min.